This fully tested, USB power delivery reference design is a high efficiency, high power density, AC/DC adapter solution with a wide input voltage range (85 - 265VAC) for laptop adapters and smartphone charger applications. It adopts active-clamp-flyback topology controlled by TI’s newest ACF controller UCC28780 as the mainly power supply stage. 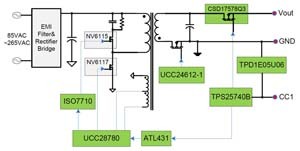 This design uses TPS25740B, TI’s PD source controller, to achieve a full PD 2.0 function. 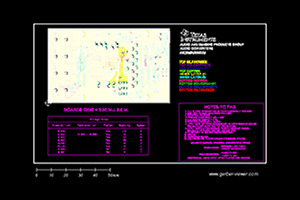 The design achieves a peak efficiency of 94% at a very high switching frequency. The design’s power density is increased to 30 W/in3, which is much higher than traditional solutions.